Saturn's Moon Mimas - Universe Galaxies And Stars Section. Saturn's Death Star Moon: Mimas. Saturn's Death Star Moon: Mimas: Image credit: NASA/JPL/SSI. 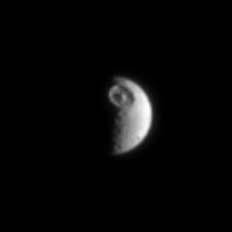 Cassini returned this image of Saturn's Moon Mimas, which looks surprisingly similar to the Death star from star Wars. Mimas is 398 km (247 miles) across, and that's not a superlaser you see, but a giant crater called Herschel, which is a third the size of the Moon itself. Cassini took this image on July 3, 2004, when the spacecraft was 1.7 million km (1 millions miles) away. Cassini will get a better view on August 2, 2005, when the spacecraft makes a distant flyby of heavily cratered moon. Soon after orbital insertion, Cassini returned its best look yet at heavily cratered Mimas (398 kilometers, 247 miles across). The enormous crater at the top of this image, named Herschel, is about 130 kilometers (80 miles) wide and 10 kilometers (6 miles) deep.